You might assume you missed the boat on tackling that home renovation project. It’s winter, after all. Time to settle in for a few months of good television, popcorn and your couch. Winter is actually a great time to re-do your basement, remodel the bathroom, and (or) tear out that kitchen backsplash that’s been bugging you since 2003. But can you rent a dumpster bin in the snowiest, blowiest season? You bet. A lot of people tackle messy home renovation projects in the nicer weather. That’s the busiest time for dumpster rental companies. That means there’s greater availability in the winter months. You might even get a dumpster bin delivered the same day you call. 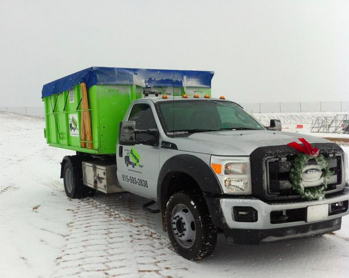 At Bin There Dump That, we’re pros at bin placement, in any weather condition. Our driveway protection system includes protective boards that rest on the driveway before the bin ever touches the ground. That means our bins are stable and sturdy, even on slippery driveways. So don’t worry — you won't have to watch in horror as your bin careens down your driveway into the street. Our roll-off dumpster bins are residential friendly. That means they snug up close and conveniently next to your house, right in your driveway. So if it snows a few inches before our arrival, please grab your shovel and clear a space for the bin. If it starts snowing heavily while the dumpster is in your driveway, you might want to toss a tarp over the top to keep the snow from piling up inside. Usually, any accumulated snow melts, and the water will pour out when the dumpster tilts for emptying. But melted snow in your dumpster can make some items waterlogged. That means they’re heavier. You don’t want to pay any more than you have to, and you sure don’t want to pay to dispose of piled up snow. If you’re planning on toting items out to your driveway this winter to toss in the dumpster, be careful out there. It’s tricky enough navigating a slick driveway on a blustery day. If you’re carrying an old couch or an armload of drywall, it’s even more precarious. Shovel a path for yourself. Spread de-icer on your pavement. 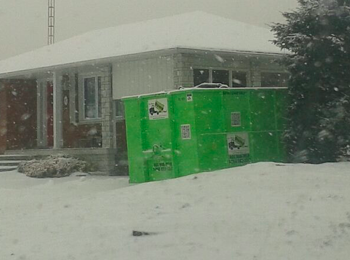 Sorry, but you can’t use dumpster rental excuses as a reason to postpone that winter home renovation project. Questions about winter bin delivery? Your local dumpster rental operator will be happy to assist. When you’re ready, contact the franchise operator nearest you.